Yesterday, Ray dug up a rawhide bone. Not just any rawhide bone, but a huge rawhide bone that I had given him months ago. He had been saving it in his toy box, just dragging it out to play a random game of keepaway every once-in-awhile until one day it disappeared. Yesterday it reappeared. When I first saw it, I thought maybe Ray had killed something and dragged it into the house. It was long and dangly and Ray was slapping his face with it. 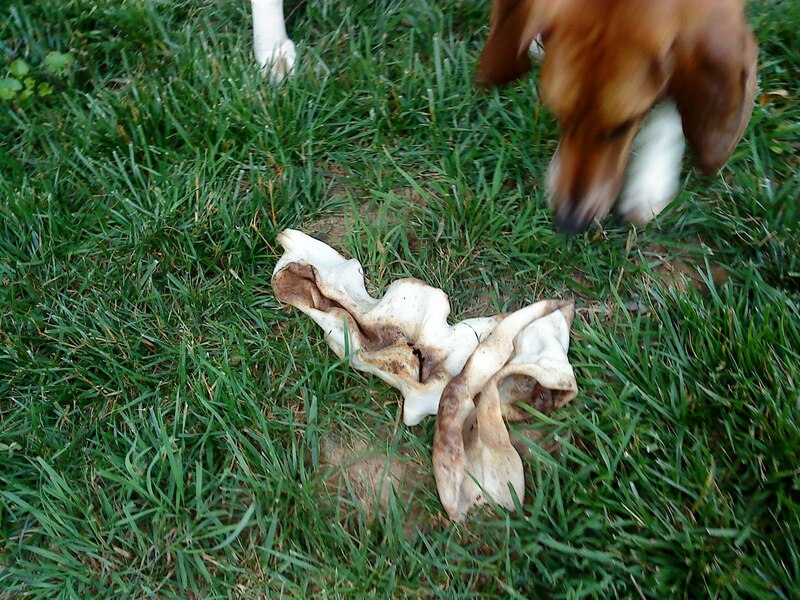 When I got closer, I realized that it was an unraveled rawhide that had turned pink and green and blue from the different kinds of mold growing on it (the pictures don't do it justice). I really didn't want him to eat the thing which, apparently, he had every intention of doing, so I took a long stick, picked it up, and carried it to the trash to throw away. 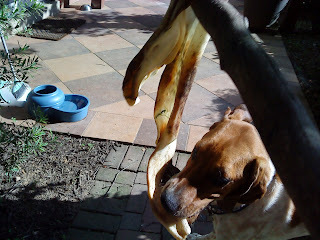 Ray was very much against this plan of action and every time I got as far as the patio where the garbage-can resides, he would grab the dangly rawhide and run back into the yard with it. On the third try I was successful. I dumped the hide in the trash and slapped the lid down on the bin. 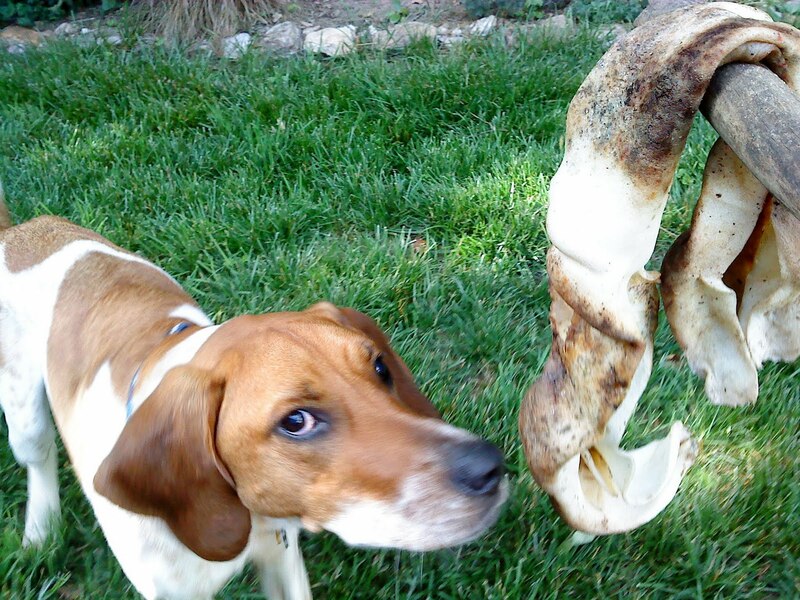 Ray spent the next hour scouring the patio trying to find his rawhide. 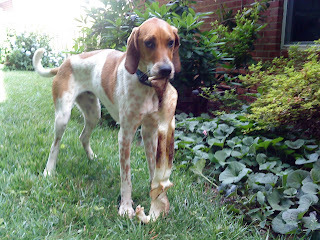 I felt really bad that I had disposed of his prize but I was pretty much convinced that eating that hide would have made our hound extremely ill. At a minimum it probably would have had Ray producing enough toxic gas that the chemical weapons experts would have been called in to neutralize the noxious emanations. Today, Ray went to daycare. When I went to pick him up, he came out of the play area and headed straight to a new display at the far side of the store. I followed him over and watched as Ray stuck his head in one bin after another, grabbing at the new merchandise; organic, free range buffalo bully sticks and other chewy buffalo things. Kristen came over and we watched Ray as he started trying to wipe his head on the chewy things in the bins. As his knees buckled, he would swipe his head against the buffalo jerky, the twisted and braided things, and the other unrecognizable buffalo parts. "He's trying to roll in that stuff!" 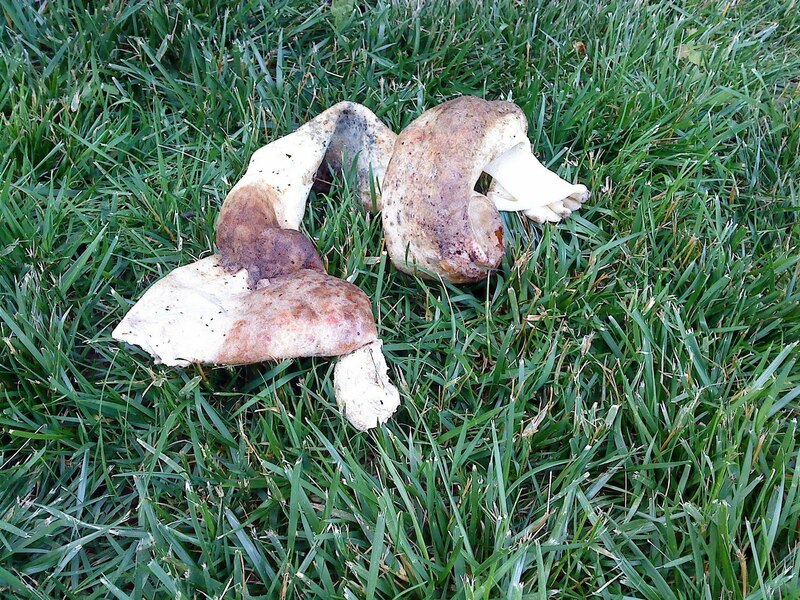 I exclaimed, "Those must be some really stinky dog chews,"
"Oh they are!" replied Kristen, "Here, smell one!" She held a thing up to my nose and I pretended to sniff at it while I held my breath. Ray was still exhibiting his bizarre semi-roll-swipe. I felt bad about his rawhide bone from the day before so I bought him a braided buffalo chew. "This should last him awhile," said Kristen, "Do you want me to unwrap it for you?" It wasn't as nasty as the rawhide from the day before but I didn't want to touch dried, stinky animal parts if I didn't have to. Kristen took some scissors and cut the shrink-wrapped plastic off the braided chew and handed it to Ray who was "watching" interestedly with his front feet propped up on the counter. Ray took the chew, happily carried it to the car, and jumped up into the back seat with it still in his mouth. It takes about 15 minutes to get home from the daycare. The buffalo chew didn't last the ride home.